Scientific efforts are underway to achieve better control of microbial infections. One promising approach is to limit damage to host cells and tissues in the course of a bacterial infection by blocking the microbial processes that cause such damage. The laboratory of Ivan Dikic, Director of the Institute of Biochemistry II at Goethe University, has been working in this field for the past decade. Dikic says, "We believe we can find new treatments that complement conventional antibiotics by targeting specific groups of bacterial effectors with rationally designed drugs. In this way pathogenic damage can be decreased, which helps patients better tolerate bacterial infection. This is a relatively new field that is attracting more and more attention in the community." To prove that this strategy is a viable option for tackling bacteria, Dikic's team studies Legionella, which are known to cause pneumonia and are especially dangerous for immunocompromised patients. Recently, the Frankfurt scientists were involved in identifying a novel enzymatic mechanism that Legionella bacteria use to seize control over their host cells. Dr. Sagar Bhogaraju, who works at Goethe University's Buchmann Institute for Molecular Life Sciences as part of the Dikic team, reports: "We showed that Legionella enzyme SdeA acts as a toxic bacterial effector. It promotes the spreading of bacteria by targeting the ubiquitin system, one of the cell's powerful protection mechanisms against stress." Ivan Dikic's group has now reported a further breakthrough in the journal Nature: they succeeded in solving the atomic structure of SdeA. "The enzyme is truly unique and catalyses a reaction in a two-step mechanism," says Dr. Sissy Kalayil, who is one of the lead Frankfurt scientists on the project. "Our results are very exciting as they reveal atomic details of this mechanism, and make the rationale design of inhibitors possible." 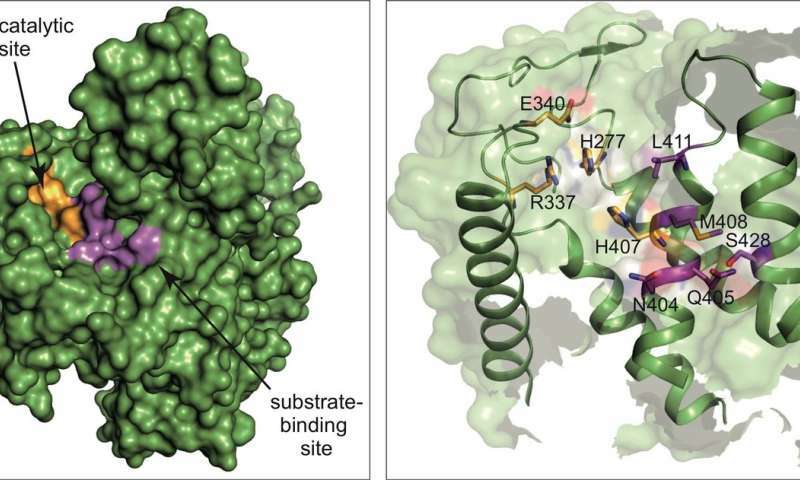 In their publication, the researchers also reveal how this bacterial effector probably chooses its victim proteins within the host cell, exerting its effect by attaching ubiquitin to them. They also developed a first inhibitor blocking this reaction in vitro. "Our basic discovery has allowed us to prove that these enzymes are druggable," Dikic comments. "But it is early days. There is a long road ahead of us before we will be able to use this novel mechanism therapeutically. And we will surely not stop here." Most likely, Legionella is not the only bacterium using this mechanism. I believe the currently massively underexploited phase therapy could also complement antibiotic use. Why isn't this already widely done? Its just totally stupid not to.